Ashly Remote is a powerful app used to design and deploy custom remote control interfaces for Net*Work*Able Ashly products over WiFi. Design your own custom remote interface. Each interface you design gives you custom control of your Ashly products―all from one place. 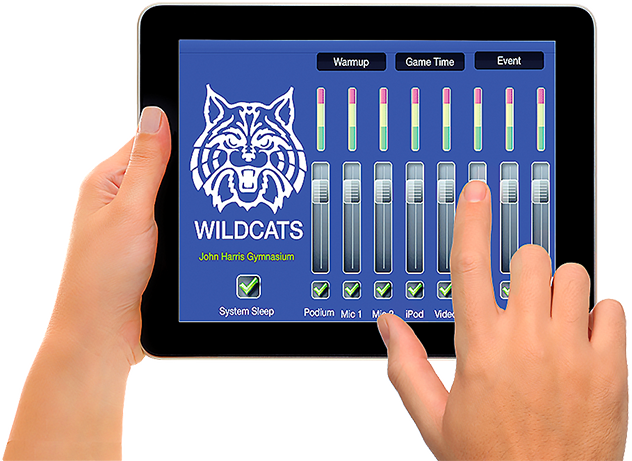 Build your remote interface to fit a specific installation by adding components specific to your system with, faders with text labels, toggles, as well as visual elements like your client’s logo and/or background images that fit a certain theme. Import previous designs to create new ones so you’ll never need to create the same remote twice. Choose from a variety of control functions. The following control functions are available, along with read-back labels for displaying status during use: Preset, Recall Gain, Attenuation Control, Mute Control, AB Source Select, Logic output, Meter, Amplifier Standby, to name a few. ashly-remote-add-controlsSaving your design. When your design is complete, name and save your client’s interface to Ashly Remote’s shared folder. When you’re ready to deploy, prepare your client’s iPad by simply transferring the saved text file to their Ashly Remote’s shared folder via iTunes. Once the remote is opened, load the profile and activate. Hand over the keys. Once your client’s interface is ready for use with their new system, security features saved within your design locks out access to your design―preventing further editing from the client’s interface. Simple and easy to understand, Ashly Remote gives your client the power to control their environment with a wireless remote interface with a common and familiar tool.